Thank you for using my blog to offer your critique of Rocco Landesman and his recent comments about supply and demand. I am not going to defend Mr. Landesman here; he’s a big boy and can do that himself. 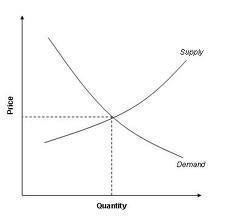 I will note, however, that it does not take a PhD in economics to understand the supply and demand curve (see below). Nor does it take a PhD in statistics to understand the graphs in the NEA Survey of Public Participation in the Arts. In general, the data shows an increase in participation in 1992 over 1982, an increase in 2002 over 1992, and then a decline in 2008 in all areas except in the number and percent of adults who watched or listened to a recorded performance. What does this tell us? Given the impact of the economic meltdown that occurred in 2008, it might only tell us that people didn’t have as much money to spend on arts-going. Or, it could tell us that attendance is declining, or it could tell us that arts participation is moving from a communal public activity to a solitary private one, or it could tell us to look again in two years to see if the trend continues. I advocate for the last before drawing any conclusions. If the amount of art we have is “perfect,” why make more? We need more art. We need more art because the world is imperfect and art helps us see those imperfections and in seeing them, correct them. The size of the audience is not perfect. We need more audience – not to help pay the bills (although that would be nice), but because people are imperfect and art helps that audience see those imperfections and improve on them. And yes, we need great art that touches the hearts of as many Americans as possible, but to do that we need art that is of, by, and for as many Americans as possible. I hope that you and the other members of the National Council of the Arts in partnership with Mr. Landesman, the NEA, the state arts councils, private foundations, educators, audience members, and artists of all kinds can help make that happen. This entry was posted in Arts education, Arts funding, arts infrastructure, Arts policy, Culture and democracy, Uncategorized and tagged Arts funding, arts policy, cultural policy, Culture and democracy, NEA, television. Bookmark the permalink.